In Stock: One only: RARE! 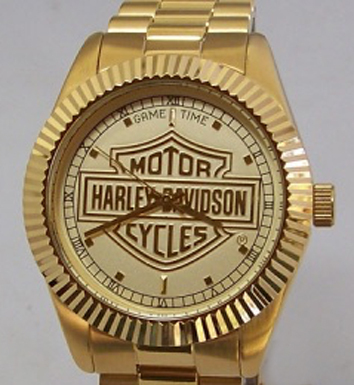 Click the button below to add the Harley Davidson Watch Game Time 23K gold logo Mens Owners Wristwatch to your wish list. Mens GameTime 23K Gold Logo Gold Tone Wristwatch. Retired: Rare - One only! 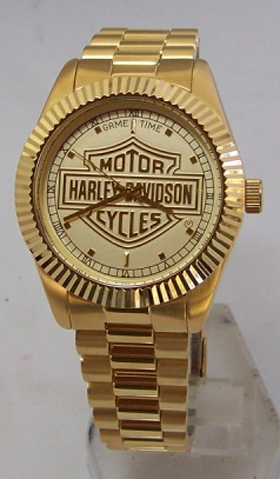 Harley Davidson Motorcycles 23K Gold Logo Watch. Mens gold plate wristwatch, New, in hand -- ships NOW! Comfortable 23K gold plate band and case. Mineral crystal, Citizens Quartz movement, Fixed bezel. Case diameter: 40mm, band width 20mm, analog display. This is a sold out Game Time Owners/Alumni style watch in new, unworn, working condition. Water resistant to 5 ATM ( 50 meters/165 ft). 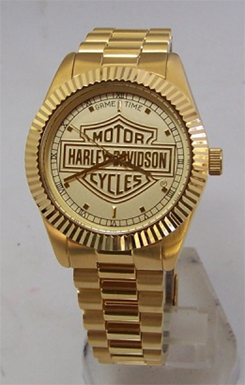 The Harley Davidson version of this watch was released in a very limited number and has been sold out for several years. 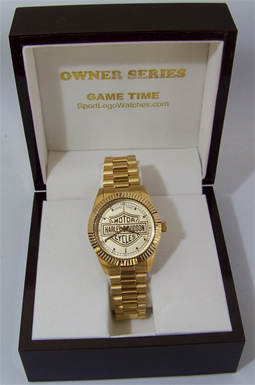 From: GAME TIME: The number 1 manufacturer of Team logo watches.Game Time watches are made of the highest quality materials. Logos are laser etched in precious metals. Built in the highest standards in material and workmanship and backed up with the only lifetime warranty of any licensed sport watch company in America. The photos and web images do not capture the full beauty of these watches.